Hello there, long time no review. If you know me, I am a total lip Junkie. So I've been up and about on new ways to create that instant pop of color to my face. Currently, the Rimmel Show Off Lip Lacquer has caught me in a love triangle. 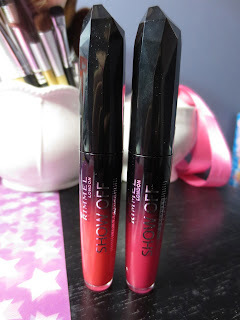 I hate gloss, but I love lipsticks and balms...this is both! To sum up this product, its everything in one: gloss, lipstick, and maybe balm. It instantly gives a WOW looking pucker with just two swipes, no extra dipping needed. The application is one of the most simple yet innovative. The spoon shaped felt tip, picks up an ample amount of product. I enjoy the tippy tip of the want, because it makes it easy to go around the cupid's bow area. The pigmentation of the lip lacquers are amazing! Bold, creamy, and packs a punch. Something I dislike about this item, it bleeds past the lip line on it's own. BEWARE! Use a lip liner, unless you want to look like a clown. Another few dislikes, its not long wearing and when it sets, its very drying and not as glossy as when you once applied it. I'd give the Rimmel Show Off Lacquer a 7/10. What do you think of the new Show Off lip lacquer? That pink swatch color is REALLY nice. I've been looking for a bubblegum pink like that. Most of the pink colors I get, looks great in person, but in photoshoots always render orange or too pale. I like how this holds up against the light. Will def be checking this out.